Today is a big day. For several reasons. 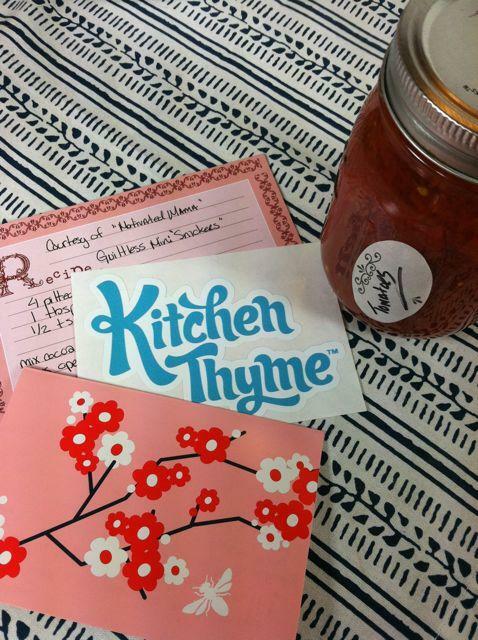 First of all, it’s Foodie Penpals Reveal Day…which is always a big deal. Second of all, Foodie Penpals turns 1 today. I started the program last September so that means this is our 12th reveal day!! In honor of that, and thanks to the lovely Calee, we have a new Foodie Penpals logo and TWO new blog badges for you guys to choose from if you are a blogger that participates and wants to display one on your sidebar. Isn’t it pretty? Here are the two blog badges you can choose from. Just copy the code in the box below the one you like and place it in your sidebar! So now let’s move on to this month’s reveal! 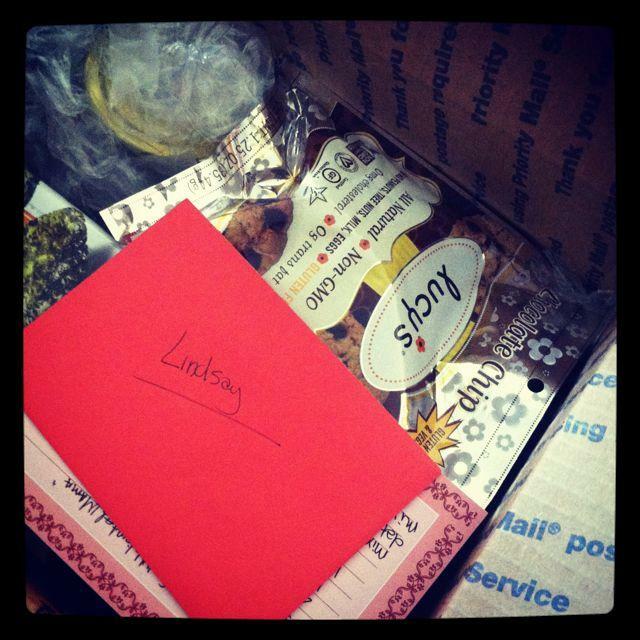 I received my package from Meg over at Veggie Girl Cooks. She’s a nursing student and has a great blog 🙂 Check out what she sent me! Yummmm. Then I examined the rest of the box! Tomatoes that she canned herself! Meg actually has a group of friends who all do Foodie Penpals and they get together and go shopping for their packages! I LOVE IT! One of her friends runs a professional rent by the hour kitchen called Kitchen Thyme and they got together and canned some tomatoes! So awesome. Next up, some local pb in her favorite flavor. Amazing! 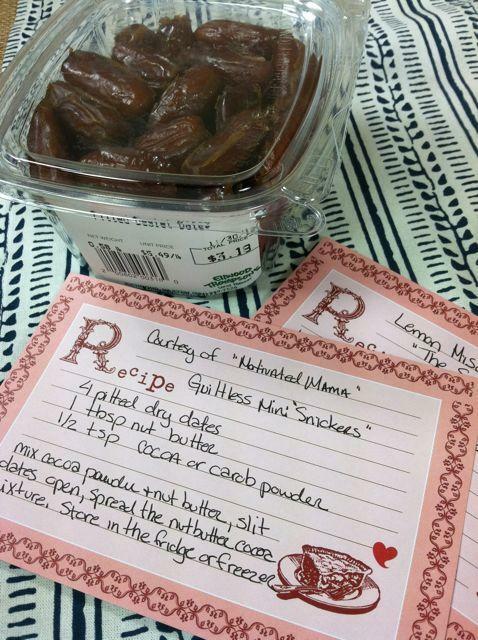 She sent me some dates and a recipe for “Guitless Mini Snickers.” Right up my alley! Can’t wait to try! That other recipe peeking out is The Smart Kitchen’s recipe for Lemon Miso hummus and she sent some sesame seaweed snacks to dip in it! 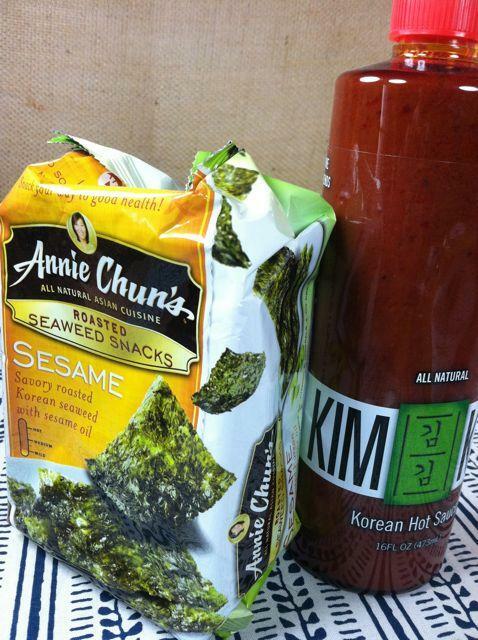 She also included some Kim Kim- a local Korean Hot Sauce that’s nice and spicy and a little bit sweet. Perfect for hubby. Thank you so much Meg for the amazing package!! Now, after reading that don’t you want a penpal of your own?! Here are the details! Current penpals…remember that you MUST sign up again each month to get back on the list!!!!! So today you should be eating an extra serving of veggies at lunch!! Take a pic. Put it on instagram, tweet it, post it to facebook. Don’t forget to tag me for a chance to be picked as the daily winner. All 31 daily winners will be entered to win a box of goodies from yours truly 🙂 Let’s see what you’ve got! Happy birthday hubby 🙂 I love you!! Whew! That’s all i think. Happy Birthday Foodie Pen Pals! The apples in peanut butter is so different. Very cool. I also love how simple the snickers recipe is. Did you try it? I’ve never tried dates! Love the recipes! Happy Birthday Foodie Pen Pals!! 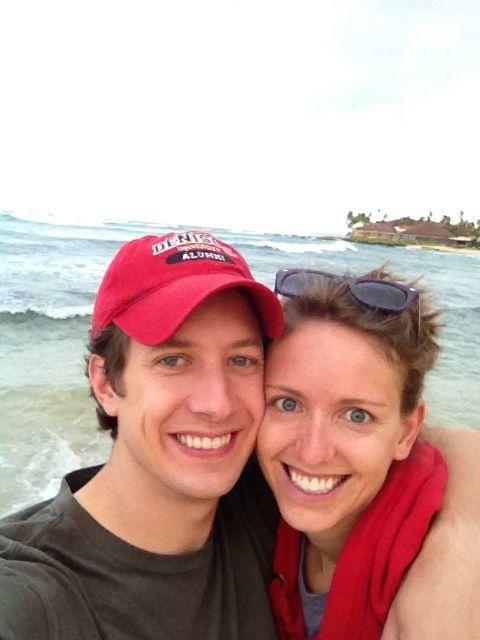 Lindsay – you’ve created an absolutely amazing program and do such a great job managing it. THANK YOU for all you do. I tried a date for the first time today! So delicious. Thanks again for organizing! I love the new logo. Calee rocks. I LOVE that she has a group of friends who all get together to work on their packages! How awesome is that?! I also am excited to try those bars for myself! They are absolutely Paleo and look YUMMY! Looking forward to another fun month and seeing what everyone got! That alternative recipe for “mini snickers” sounds amazing! I may try it! What a fantastic package! 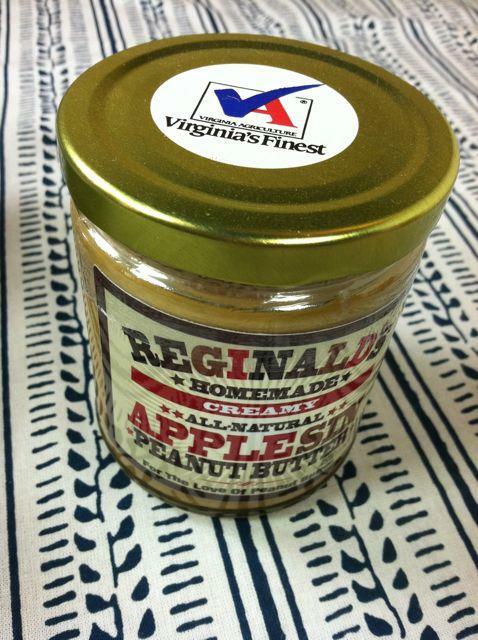 That peanut butter sounds amazing and how thoughtful to include a couple of recipes…I should totally do that next month! HAPPPY KINDA BELATED TO YOUR HUBBY!!!! Yay! Happy 1st Birthday to you!! Happy Birthday to your hubby too! 2 birthdays to celebrate?? how lucky!! AND How sweet!! The guiltless snickers sound yummers,,and homemade canned tomatoes too?? impressive :] Looooove the new logos btw! So bright and colourful! Congrats on the 1 year anniversary! And thanks for my FPP package!!! 🙂 So excited to spread the word and keep participating! Have a great day! ahh happy 28 hub! still young and thriving. hehe. And awesome job Calee. So talented! Like you!! 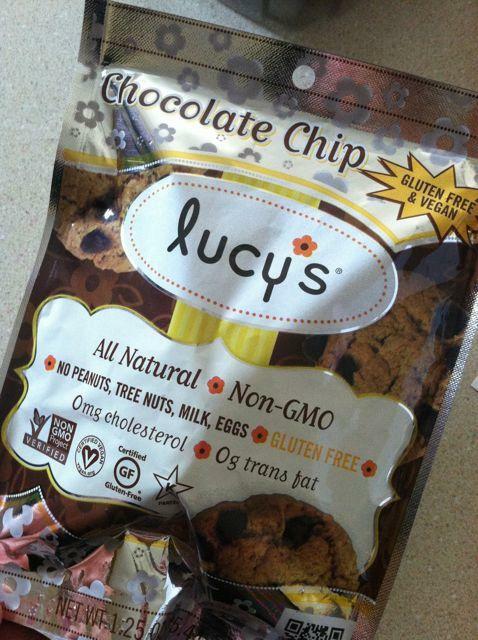 Enjoy those lucy cookies, i inhale those like mini chips ahoy! LOVE this photo a day challenge. I’m joining. I also need to get back into the foodie pen pals. You always have such great ideas! 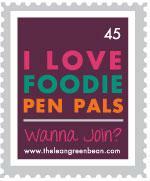 Happy One year anniversary to foodie pen pals! That is so awesome!!! Happy October too! Can’t wait to join in to the photo a day challenge! Happy Birthday to Foodie PenPals! Thank you for all the work you put into this every month – it truly is your baby! Ok seriously, so much awesome in this post! I love the “stamp” design – too freakin’ cute. 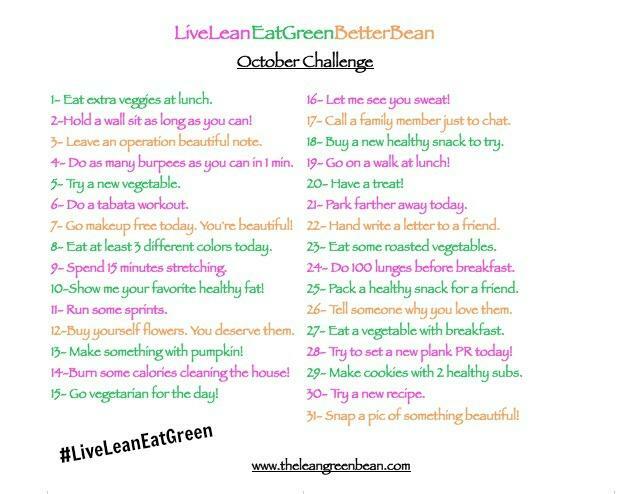 Also love the October challenge! I’m down. Here’s to eating some extra veggies at lunch today! Loved my box this month! Thank you for starting such an awesome program! Thanks for the shoutout! I love that we ended up with two badges. So pretty. I’m rockin’ the apple one on my blog (and it totally matches … nice!). Happy B-Day Foodie Penpals! Thanks so much, Lindsay, for organizing this! 😀 It looks like you got an AWESOME loot last month. I can’t wait to scope out what everyone else got ;). I am loving the date snickers idea! Cannot wait to try. Thanks for organising FP! YUMMMM miso lemon humus! Why did I never think of that? Everything loos delicious, as always. 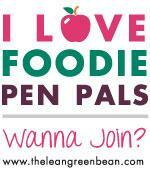 I am IN love with the new Foodie Pen Pal Logo and Blog Badge…It is so sharp and appealing. Nice Job Calee. I immediately changed my Blog badge to display the new one. Happy birthday Foodie Penpals!!! Thanks for organizing this! Homemade Canned Tomatoes? 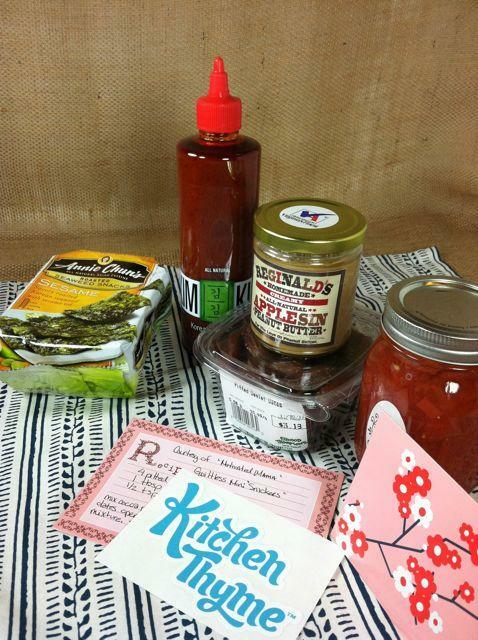 A Foodie-Pen-Pal-Shopping Party? Date-Snickers? Wow. Meg sounds INCREDIBLE. I am subscribing to her blog ASAP! This was my first month participating and I loved it! I will definitely be back every month from now on. Thanks for all your hard work and happy 1 year anniversary and happy birthday to your hubby! Thanks so much for all your hard work Lindsay. I know doing this each month must be overwhelming. You got a great package. So much good stuff in there. 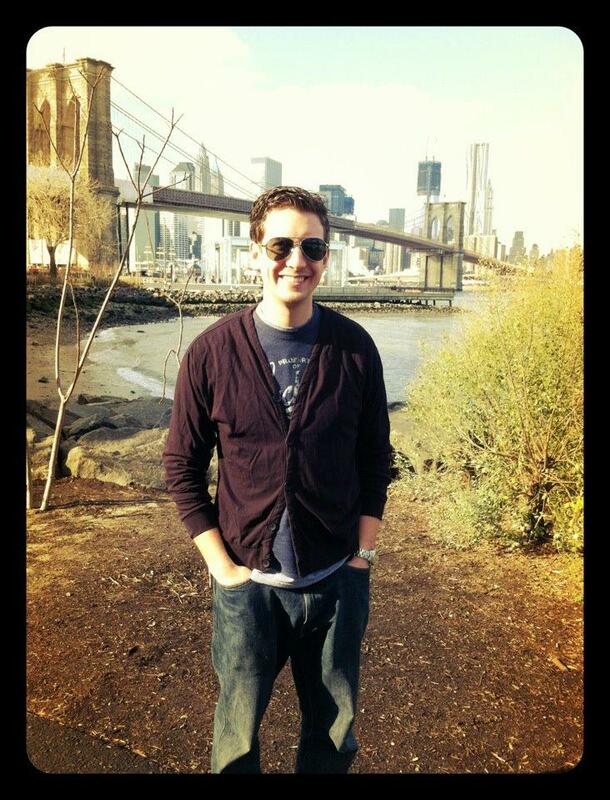 Your guy looks a little like Josh Groban, especially the pic in the hat. Thanks so much for much for doing all this work and Happy Birthday Foodie Penpal… What a great experience. I enjoyed going through my penpals blog to find her the right things to send her and equally enjoyed opening up my box… So nice to not get bills. Yay! Congrats on FPP turning 1! So exciting…you’ve done and are doing an amazing job with it! Thanks! just registered for the November 1st reveal! excited!! Happy birthday Foodie Pen Pals! I was thrilled to get my first box this month! I want to be a part of the foodie penpal!! [WORDPRESS HASHCASH] The comment’s server IP (173.201.196.115) doesn’t match the comment’s URL host IP (208.109.47.128) and so is spam. [WORDPRESS HASHCASH] The comment’s server IP (66.96.128.72) doesn’t match the comment’s URL host IP (66.96.147.120) and so is spam. [WORDPRESS HASHCASH] The comment’s server IP (76.74.254.39) doesn’t match the comment’s URL host IP (74.200.243.251) and so is spam. [WORDPRESS HASHCASH] The comment’s server IP (74.200.247.238) doesn’t match the comment’s URL host IP (76.74.254.120) and so is spam. [WORDPRESS HASHCASH] The comment’s server IP (184.168.46.218) doesn’t match the comment’s URL host IP (50.63.68.1) and so is spam. [WORDPRESS HASHCASH] The comment’s server IP (174.143.11.196) doesn’t match the comment’s URL host IP (98.129.229.192) and so is spam. [WORDPRESS HASHCASH] The comment’s server IP (76.74.255.104) doesn’t match the comment’s URL host IP (76.74.254.120) and so is spam.